It’s like a kebab. But not. Or maybe like a sandwich. But no, not really. It’s a wrap. But it’s not healthy. 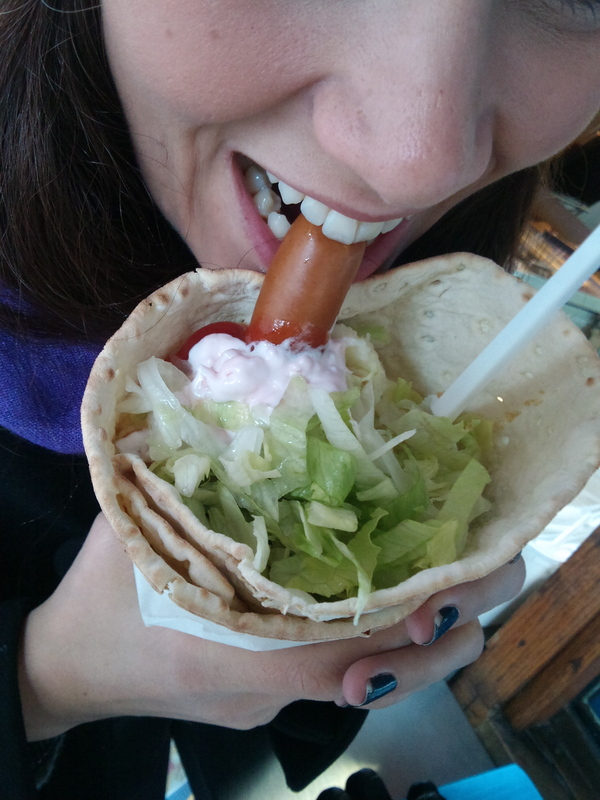 Help me out, what is a hot dog, pink shrimp salad, mashed potatoes and lettuce wrapped in flat bread? It’s really f&%ing hard to eat, is what it is. It is Sweden’s contribution to the world’s greatest hangover foods. A kebap (that’s what I’ve settled on, a kebab and a wrap) that can satisfy even the strangest of cravings. The bread, tunnbröd, is like a Swedish tortilla and it is filled with unruly mashed potatoes that are seemingly plotting their escape through the bottom and come closer to freedom with with every bite. You have to start by digging out the unnaturally pink and mayo-heavy shrimp salad with a fork to even have a shot at getting in a bite. And surrounded by all of the potatoes and shrimp, the hot dog seems insufficient and awkward as it pokes out the top of a meal with a circumference the size of a large movie theater soda. But this seemingly disgusting combination of flavors, called Tunnbrödsrulle in Swedish, is actually… tasty. That is if you can stop laughing enough and shaking your head to take a bite.